Telomeres are the terminal part of the chromosome containing a long repetitive and noncodifying sequence that has as function protecting the chromosomes. In normal cells, telomeres lost part of such repetitive sequence in each mitosis, until telomeres reach a critical point, triggering at that time senescence and cell death. However, in most of tumor cells in each cell division a part of the telomere is lost, however the appearance of an enzyme called telomerase synthetize the segment that just has been lost, therefore conferring to tumor cells the immortality hallmark. Telomerase is significantly overexpressed in 80–95% of all malignant tumors, being present at low levels in few normal cells, mostly stem cells. 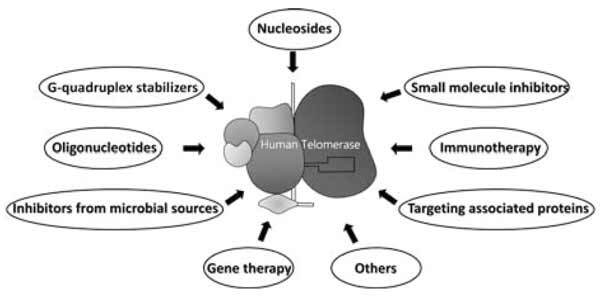 Due to these characteristics, telomerase has become an attractive target for new and more effective anticancer agents. The capability of inhibiting telomerase in tumor cells should lead to telomere shortening, senescence and apoptosis. In this work, we analyze the different strategies for telomerase inhibition, either in development, preclinical or clinical stages taking into account their strong points and their caveats. We covered strategies such as nucleosides analogs, oligonucleotides, small molecule inhibitors, G-quadruplex stabilizers, immunotherapy, gene therapy, molecules that affect the telomere/ telomerase associated proteins, agents from microbial sources, among others, providing a balanced evaluation of the status of the inhibitors of this powerful target together with an analysis of the challenges ahead. Telomere, Telomerase, Inhibitor, Cancer, Preclinical, Clinical trials. Laboratory of Molecular Oncology, Department of Science and Technology. Quilmes National University, Bernal, Buenos Aires, Argentina. R. Saenz Peña 352, (1876) Buenos Aires, Argentina.